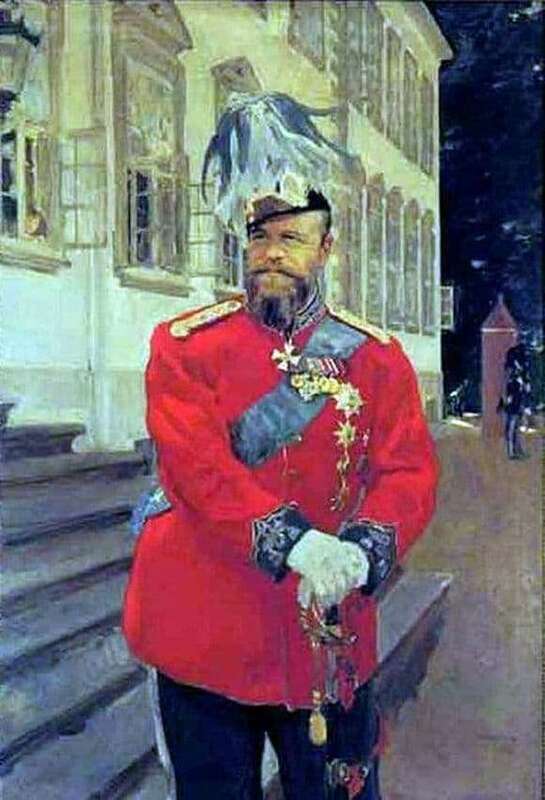 Serov’s painting “Portrait of Alexander III” was painted in 1899. At present, the work is kept in the officers’ fund of the Royal Life Guards in Copenhagen. The emperor is depicted in an elegant uniform and a solemn pose near one of the main stairs of the Fredensborg Palace (Denmark). The artist painted this portrait, being directly in Copenhagen, where he visited more than once. The palace was written from life, but, unfortunately, Alexander III himself posed for him, but a simple sergeant. Golden epaulettes and honorary orders shine on the bright red canvas of the uniform, the face is full of joy and pride, the pose is confident and majestic. Serov was a brilliant portrait painter (knowingly, by the beginning of the twentieth century, he was recognized as the first portrait painter of the Russian Empire): he wrote Alexander from memory when he had already died. The background of the picture is important, plays an important role in emphasizing the figure in the foreground: the recurring elements of the windows and steps of the stairs create a rhythm, creating a sense of dynamics and solemnity, architecture and a high-ranking personality harmonize perfectly within the picture. Many people know that the artist treated Alexander III with special trepidation, and the emperor helped him in many ways in his life’s journey, including the publication of his father’s two volumes. For the life of Serov, many portraits of the royal family were written, in which characters were felt, and not just the exterior was copied. Moreover, Serov did not require so much money for his work, since he did not want to feel captured, to lose the freedom of creativity. Once with the painting “Portrait of Alexander III” there was such a case: Princess Yusupova praised this portrait, called it the best, and a modest artist noted that it’s not about being the best. The fact is that the other portraits were completely bad.